Corsicana was founded over 40 years ago to manufacture furniture and bedding for mobile homes and has evolved into the mattress company it is today. The company mattresses are made in the USA and consist of foam, memory foam, gel, coil, and hybrid designs. The mattresses come with various warranties. The product line includes, Cool Reflections Memory Foam, Pocket Springs, Premium Inner Springs, Memory Foam, Double Sided and more. The mattress sizes include twin, twin xl, full, queen, king and California king. In addition to selling through retailers, Corsicana also sells to "hotels, resorts and government organizations across the country." You can find a retailer by using the GoodBed website's store locator. There are a few online general reviews of the overall quality of Corsicana mattresses and the company itself. BirdEye was created as a way for companies to "manage online reputation and customer experience." The ratings for Corsicana Bedding are a mix of good to very poor ratings. Customers complain of sagging mattresses after only two years of use. Other customers comment that they love their purchases and that the quality is good. Price: Fair and/or clear pricing. Initial comfort: Really comfortable when new. Soft comfort: Feels nice and soft. Surface integrity: Develops body impressions. Sleeping surface is lumpy or uneven. Overall support: Feels saggy like a hammock, or mushy with no support. Some reviewers wake up with back or neck pain. The Better Business Bureau (BBB) gives Corsicana an A+ rating, stating that it "determined that Corsicana Bedding Inc. meets BBB accreditation standards." However, there are a total of 27 complaints filed against Corsicana with the BBB over the past three years with nine having been closed in the last 12 months. Only one customer filed a review; it states the purchased mattress "failed in 6 months and they refuse to replace it." 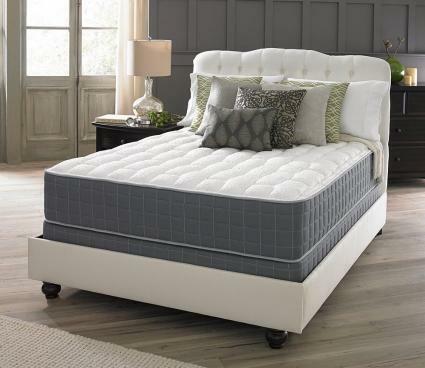 Corsicana Cool Reflections 9620 Mattress has a 12" deep profile that includes 2" gel visco and 2" of memory foam that give body contouring properties while offering advanced pressure relief on the body during rest. The core is made of 6 inches of high-density foam with padding layers of 2-inch ComfortU foam. According to Beds.org, the cotton stretch-knit mattress cover features a zipper so it can be removed for cleaning. The inside of the cover has a "fire sock made of flame resistant materials." Beds.org advises that foam mattresses should never be supported with "traditional box springs." Instead, use either an adjustable bed, platform or slatted frame. GoodBed recommends it for people who sleep on their side, back or stomach with medium softness level. Smooth quilted luxury cover doesn't interfere with cooling properties of the gel visco. Light motion isolation (bed movement when turning over). Price ranges from $400 to $900, depending on mattress size. US-Mattress.com customers comment that the mattress "contours the body quite well," provides "comfortable sleep," and one customer stated that the cooling properties keep her husband cool at night. The Pocket Springs Collection features innerspring mattresses. Beds.org reports that the mattress construction reduces motion transfer and provides pressure relief. Pocket coils (Marshall coils) are independent coils that are encased in pockets made from fabric. The pockets are tied together with fasteners and typically create a rectangle-shaped grid, although they can be arranged in a hexagon grid or nested. The grid shape depends on the desired coil density. The spring coil grid is encased with a wide foam edge to lend greater support, especially when sitting on the edge of the bed. There are several models within the collection that include Elite, Opulence, Fremont and Auburn. Beds.org advises consumers that retailers don't always advertise the models by name. Instead, they use the Manufacturer's Product Number (MPN) and this can make it difficult for comparison shopping. Mattress heights for the collection are from 9 to 16 inches. Range for the overall firmness is from extra firm to plush. This collection features coil technology with a track record for durability. The coils are offset in reverse to reduce the motion transfer that occurs when a bed partner shifts or turns over. This coil design also prevents what's termed as "roll-together" that occurs when the mattress indents where the body rests after a time of wear. The Sleep Inc. 13-inch BodyComfort Select 2000, available at Amazon, is part of the Premium Inner Springs Collection that utilizes a gel infused lumbar band with memory foam in addition to the hundreds of inner springs. The gel lumbar band provides additional back support. "High quality & American made (no toxic chemicals like you might get with an imported mattress)." "No smell at all, packaged in a protective plastic bag." "It is a good firm mattress with a very soft & comfortable covering." "Everything it claims and more." Two customers were disappointed in the gel and memory foam, stating it wasn't as firm as they needed. But another customer stated, "I don't like squishy beds, so I absolutely love the firmness of this." This collection features double-sided pillow tops that can be flipped over. This gives the mattresses an extended life span of two times that of single-sided pillow top mattress. Sleep Inc. Mattress is a Corsicana brand name. The 280 Traditions III double sided pillow top mattress is a popular choice for those wishing for a medium firm mattress. The padding layers are made from medium to soft polyurethane foam. The pillow top Tencel fabric wicks the moisture away from body, making for a comfortable sleep. US-Mattress.com customers reported that that the mattress is comfortable. One customer is a side sleeper with a sensitive back and finds the mattress firmness to be perfect. The alternative to innerspring mattresses, the Memory Foam Collection use Visco foam. This technology is responsible for reduce motion transfer. In addition, this type of mattress offers outstanding support as well as relieving the pressure to the back, shoulders and hips. Kid's Visco Memory Foam pink or blue mattresses give all the properties of the Visco foam technology. This Visco Memory foam mattress sold by Home Furniture Mart provides the comfort expected of this type of mattress. Mattress City Inc. recommends this all foam mattress for those experiencing "joint pain from conventional innerspring mattresses." The Micro Coil Collection is made using the latest sleep technology for a premium mattress sleep support system. The mattresses are made from individually encased springs along with encased ultra-flexible wire coils. Combined, these provide what is termed by the company as "ultimate comfort." According to Beds.org, there are two Corsicana Micro Coil mattresses available. They are luxury hybrids that combine the micro coil technology with gel and gel memory foam technologies. The two mattresses in this series include the Europa 1000 Gel Micro Coil and the Euphoria Series II Hybrid Gel Memory Foam HD Micro Coil. The main difference between the two mattresses is the number of coils, respectively 1,000 and 2,000 coils. Compatible with foundations, such as full-support steel bed base, European wood slats, platform and adjustable beds. Not recommended for traditional box springs. The price ranges from $850 to $1,500. Michigan Discount Mattress describes the mattress in the video above as having a medium support with enough firmness that back sleepers would enjoy. Corsicana mattresses offer a large range of choices to pamper those who sleep on their side, back or stomach, though customer reviews are mixed. The selections include coils and springs to memory foam and gel designs that offer options for the right fit for a good night's sleep. Just be sure to check reviews for the specific model you're interested in so that you won't be disappointed.